A scene from Thoreau in November 2014. A 2010 suicide cluster claimed the lives of up to 15 young people in Thoreau and surrounding, isolated villages like Prewitt and Smith Lake – communities separated by hundreds of square miles of desert, asphalt and dirt roads, and sandstone cliffs. This series is the culmination of two years of work examining the higher suicide rate among Native American youth, which we found is probably even more severe than official statistics indicate. We spent so much time on this project because we wanted to delve deep and treat the people we were reporting on with sensitivity and compassion. We tried to listen to feedback from Native Americans and others about how to responsibly report on suicide. The result is a series that doesn't shy away from the problem but also attempts to shine light on children who are choosing life, on programs that are working, and on how all of us can help. We hope we've contributed something positive to the discussion on an incredibly personal and sensitive topic. We value your feedback - positive or constructive. In addition to posting comments on the articles, you can email us or join the discussion on Facebook and Twitter. Please also check out our Native America Project. Turning into Thoreau from the interstate, the town’s most prominent feature is a closed market, its doors chained shut. Nearby a metal water tower looms, “THOREAU” painted in all-caps on its face amid squares of gray paint that covers graffiti. Almost two hours west of Albuquerque, the town is part of the Navajo Nation’s southeastern “checkerboard” country, where federal, state, county, private and tribal lands and jurisdictions intertwine. It’s mid-June 2014 and by noon the sun is scorching volunteers and competitors at Thoreau’s second annual community skateboarding event. Young volunteers chat under a small tarp, welcoming arrivals, registering teens arriving with longboards and oversized soda cups. They coax all comers to sign up for a healthy-cooking class, the Women’s Healing Circle, or GED classes on offer at the nearby Thoreau Community Center. The sky is cobalt blue. A train rumbles by, horn blaring. Marvin Endito, who works for the tribe’s Diné Youth Crownpoint field office, hoists scaffolds for a large tent to shade an area alongside the Thoreau Community Skate Park. He is loaded up with new tribe-purchased skateboards for each kid who shows up. Alex Begay, right, with the National Indian Youth Leadership Project, leads a group ice-breaking activity at the beginning of a youth board meeting at the Thoreau Community Center on Nov. 5, 2014. To the left of Begay are Damarco Pierce, wearing a cap, and Raelynn Hill. Both are Youth Board members. “We’re trying to make Thoreau a more positive place,” smiles Thoreau Community Center Youth Board member and high school senior Raelyn Hill, her eyes framed by thickly mascaraed lashes. Nearly a third of the town’s population of 1,865 — 80 percent of whom are Native American — lives in poverty, according to the 2010 census. It’s not the easiest place to grow up. Hill helped plan the skate competition, one of many community events, which have included back-to-school pow-wows, winter dances, and even a half-time flash mob during a school basketball game, organized to re-engage teens. About 50 people have shown up to compete. Some families shelter from the sun in air-conditioned cars. Others rest in the shade of Endito’s giant tarp near the band. Toddlers and young children are playing as grandmothers and grandfathers, moms and dads, aunts and uncles look on. The day’s festivities are a calculated response to the crisis residents faced four years earlier. In the span of one year, as many as 15 young people died by suicide in Thoreau and surrounding communities like Prewitt and Smith Lake. The Thoreau Community Center, on the north edge of town, shown here in November 2014. Thoreau Community Center and Project K’e staff are working with Navajo Nation officials in Crownpoint to create a local crisis-response system. Precise numbers are difficult to uncover. Priscilla Manuelito, a youth suicide prevention worker and executive director of the Thoreau Community Center, says 15 young people in Thoreau and nearby villages died by suicide in 2010. A local school official put the count at nine, for Thoreau only. A July 14, 2010 news report in the Farmington Daily Times stated that Thoreau and Crownpoint had amassed 26 suicide attempts by that point in 2010, half of which were fatal. But state statistical reports record only three Native teen suicides in all of McKinley County that year, reflecting the problems NMID found with under-reporting of suicides in Indian Country. Whatever the final number, the deaths shattered the community. In their aftermath, a Teach for America volunteer at the middle school suggested that community members clean out an abandoned building on the edge of town and transform it into a teen center. Manuelito and others pitched in. They created the Thoreau Community Center, organizing its youth board. They hoped to give kids a place to talk, be heard, eat a healthy meal, and organize fun events like the skate competition. They hoped they could make the community’s teens and kids feel less alone, less isolated. Left to right: Hector Largo, Damarco Pierce (background with cap), and Jacob James look in November 2014 at produce they helped plant in a greenhouse behind the Thoreau Community Center. Just around the corner from Thoreau Middle School and less than a half-mile from the town’s skate park, the community center is a subtle but important outpost in an otherwise hardscrabble town where jobs and hope can be hard to come by. 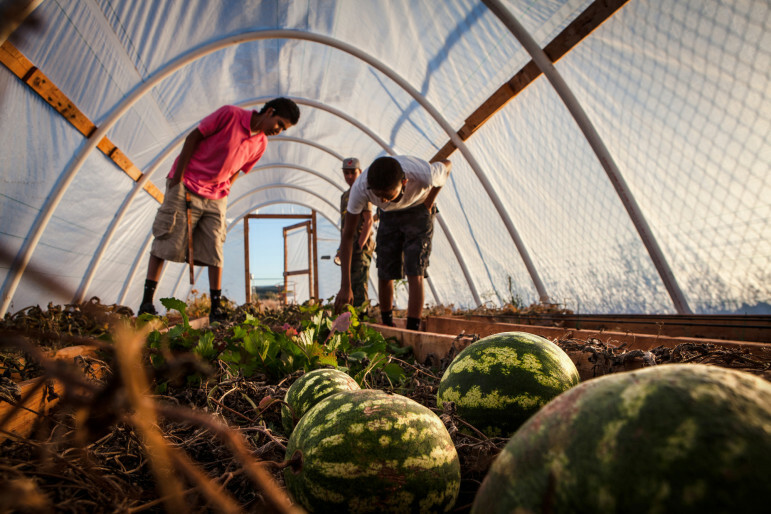 Today, youth board members like Hill and Manuelito’s middle-school aged son — a radiant boy, Virgil, who shows off the center’s gardens and greenhouse — work to increase suicide awareness. Together, they are confronting a long tradition of silence. At the skate park, Endito watches the skaters’ performances closely. He recognizes the signs of depression in a lot of the Navajo kids around Thoreau, he says. He lets them know that even he, a former Marine and combat veteran, has struggled too. They often act like they’re not listening, but sometimes, a kid he didn’t think was listening later thanks him for sharing his story. Arriving skaters sit against the cyclone fence around the park, keeping mostly to themselves. Cigarette smoke drifts up from the group. Pointing out the spray-painted graffiti, one middle-aged man watching says the park is an epicenter of drug use and gang activity. Police records attest to the fact that the park is frequently the scene of fights throughout the rest of the year. But today, it’s a venue to showcase the skills of kids the community doesn’t always celebrate – youth who feel marginalized and alienated. Skaters are frequently seen in these terms in the community, according to several of the event’s organizers. In a community where high school athletes are celebrated, skaters are often defined in negative terms, as being kids who are not into sports or school. The skate competition gives kids the chance to demonstrate their board skills and emphasize their talents, says Jared Delgarito, a young man who volunteers at the community center. “They’re some of the kids who need the most attention,” he says. Sheldon Sanders (left to right), Timothy Anderson, Tayton Vandever, Aaron Galvan, Eliot Parks and Abel Platero wait for their runs at a skate competition held on June 21, 2014 in Thoreau. The event was put on by the local community center to give the youth something positive in which to participate. L.J. Vandever, 10, waits for his turn to skate at a competition held June 21, 2014 in Thoreau. It’s still difficult for many in the community to confront alienation, depression and suicide directly. But people are starting to talk more today than they were in 2010 as longstanding taboos are being questioned. Before the crisis, both elders and kids were reluctant to talk openly about suicide, Manuelito says. This taboo of speaking about death is common among New Mexico’s tribal communities. Events like the skating competition are one way to bring the community together. But Manuelito acknowledges there’s still work to be done. Just a few hours after the skate event, the McKinley County Sheriff’s Office responded to a teen’s suicide attempt outside the nearby village of Prewitt, a dozen miles to the east – nearby by local standards. It’s one of 15 attempted-suicide calls county deputies will respond to in June 2014, 911 dispatch records show. One of those calls demonstrates the reality in some parts of rural New Mexico. A deputy responded to a call from a remote single-wide trailer only to discover it was on tribal, not county, land. He had to wait for Navajo Nation police to arrive. Eventually, the boy was brought to a medical center, according to Sheriff’s Department records. It’s unclear what happened from there, however. There are no inpatient adolescent mental health centers in this part of New Mexico. That local shortage of mental health providers and facilities is part of what brought Jasmine Henio back home to Thoreau. Now a director for Project K’e, which works closely with Thoreau Community Center staff on suicide prevention efforts, Henio attended high school away from the community at Navajo Preparatory School in Farmington and then earned degrees in psychology and criminology at the University of New Mexico in Albuquerque. She’d envisioned joining the FBI as a criminal psychologist. Seeing how repeated run-ins with law enforcement can affect the trajectory of young peoples’ lives, and how counseling and support earlier in life can help altered her plans, however. She also noticed that there aren’t enough mental health workers to help youth who struggle with mental illness, neglect, or abuse. Those who work in clinics near Thoreau, Grants and Gallup are busy with adult clients struggling with alcohol and substance abuse, she says. Instead of donning a badge and a gun, Henio is working with Project K’e to help with Thoreau’s suicide prevention and “postvention” programs while completing her third year toward a master’s degree in counseling. Catching problems early can save lives, she believes. Still, the past is powerful and deaths from suicide hover close to many conversations. Manuelito recalls how in 2010, attending funerals and family gatherings became routine in and around Thoreau. “You would just get done with one and there would be another one,” she says, remembering the youngest victim, who was only 10 years old. In the five years since, the Thoreau area has lost far fewer young people to suicide – four, as best as Manuelito and the center’s Jaclyn Delgarito can tell. Two victims were age 19; two were younger, Manuelito says. 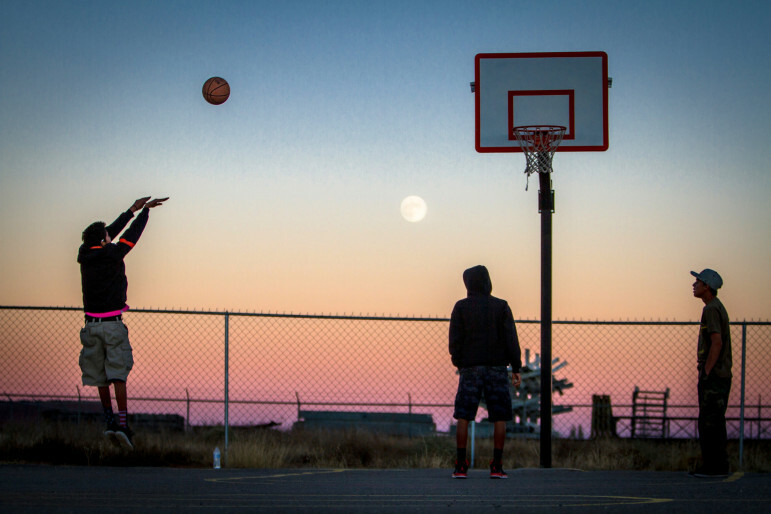 The moon rises over Thoreau as Hector Largo, left, takes a jump shot, while Jacob James, center, and Damarco Pierce, right, await the rebound at the Thoreau Community Center basketball court in November 2014. The boys hung out at the center after school, working on homework and shooting hoops before a youth board meeting that evening. In her own community, Manuelito has continued to push tribal officials, families, and school officials to end the tradition of silence. She doesn’t mince words with parents who don’t get their kids the help they need, either. That’s neglect, she says. For many kids today – not only in Indian Country, and not just in New Mexico – school may be the place they’re most likely to find help. Even if clinics had more resources, teens can be reluctant to visit health centers where relatives and neighbors work. It’s sometimes easier, young people have told NMID reporters, to ask for help at school-based clinics, where outsiders might work. Teachers are well-poised to notice a child’s suffering and to realize he or she needs immediate help. But too frequently, the signs can be misinterpreted or mishandled. In 2010, for instance, the state Child Fatality Review Board noted that more than half of the New Mexico children whose suicides they reviewed had classroom behavioral problems. Many had been suspended or expelled, sometimes shortly before their deaths. There are ways to try to prevent those deaths. Each school in New Mexico must have a state-approved plan outlining protocols for staff responding to everything from disrupted bus service and flu outbreaks to truancy and gang activity. Suicide prevention experts keep hoping the state will require the inclusion of suicide prevention — things like what to do in the aftermath of a suicide, how to manage grief and ensure additional deaths don’t occur, and how to prevent suicide deaths from occurring in the first place. But the state leaves that decision up to individual school boards. Some schools lack such safety plans entirely. 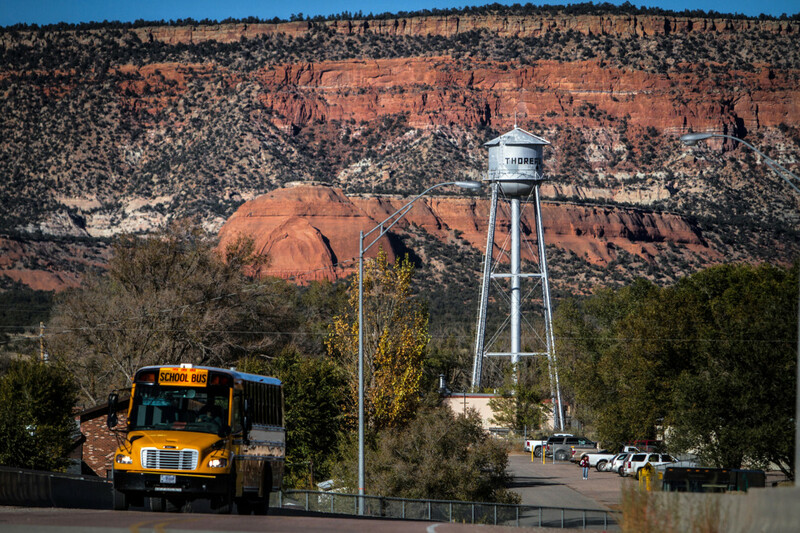 According to Public Education Department records, those include schools in several communities that NMID’s analysis suggests might have suffered youth suicide clusters, like the Jicarilla Apache schools in Dulce and the Grants School District, which includes the Laguna and Acoma pueblos. The state Department of Health offers an online suicide prevention training program. Any middle school or high school teacher can spend an hour learning about how to recognize risk factors and seek help. But of the state’s more than 23,000 public school teachers, only 475 have logged in since the training program went online in 2012. In Thoreau, that means Manuelito and her staff have been pitching in at the schools. In March 2014, for example – several years after the cluster of suicides in this area — community center staffers helped administer a survey to students at Thoreau Middle School looking for signs of suicidal ideation. Manuelito says the school’s principal offered counseling services for six or seven at-risk kids leading up to the survey. The survey results stunned Manuelito. Forty-one of the 215 6th, 7th and 8th-grade students answered yes to one or both of these questions: Do you want to kill yourself? In the past six months, have you tried to kill yourself? Manuelito organized an emergency community meeting the next month. County, chapter, tribal and school officials talked with residents and one another. A week later, the school district announced a crisis response, sending licensed counselors and therapists to Thoreau Middle School to interview students. “Some, they thought were at immediate risk,” Manuelito says. “The rest, they contacted the parents and told them to get help.” Manuelito heard that the school was planning group therapy sessions to begin the new school year. School officials did not grant interviews. A follow-up survey conducted in September suggested that such vigilance helped. Seven Thoreau Middle School students reported thoughts or attempts of suicide in that survey. 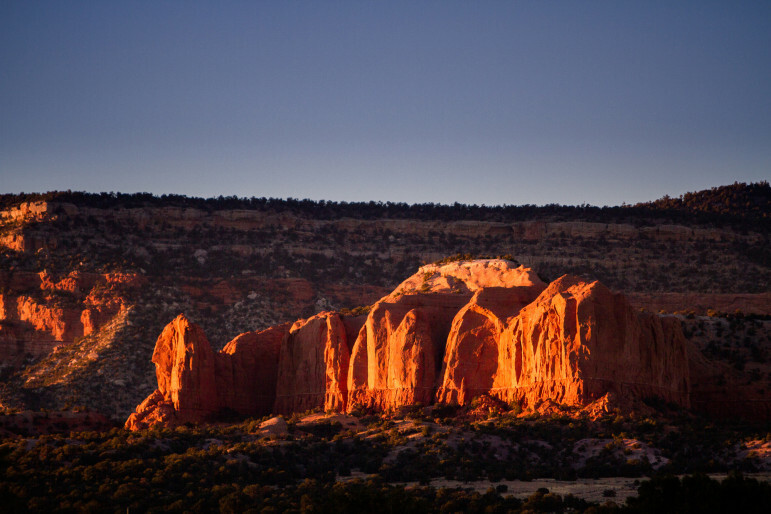 Castle Rock, a landmark visible from the Thoreau Community Center on the north side of town catches the last rays of sunlight on Nov. 5, 2014. But like many public health efforts — think, vaccination or environmental pollution control – suicide prevention efforts require long-term commitment. Resources pour into a community where suicides or attempts have recently occurred. After things quiet down again, grants aren’t renewed, counselors are re-assigned, and programs peter out. 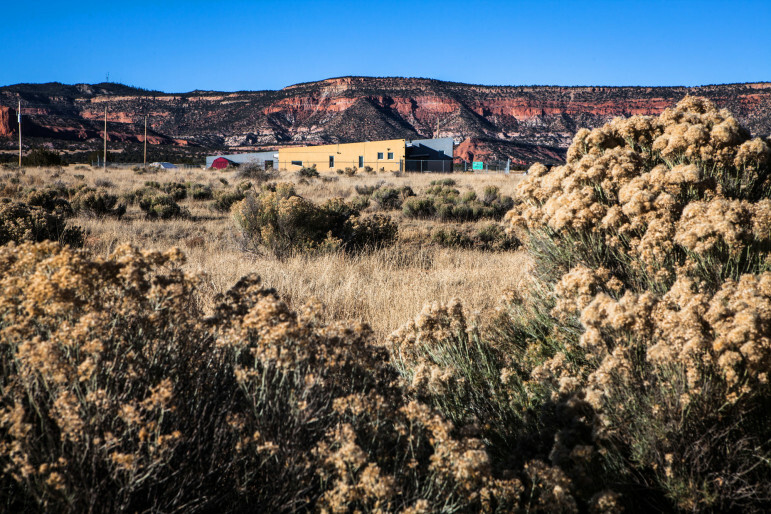 When McKinley County stopped funding the community center in July 2014, Manuelito stepped up her chase for short-term funding from organizations, the Navajo Nation, and other local governments. Manuelito and her staff are working with Navajo Nation officials in Crownpoint to create a local crisis-response system. Meanwhile, a contract to help enroll community members in Medicaid or the state Health Insurance Exchange kept lights on at the center. To sustain communities over the long-term, suicide prevention efforts can’t be ad hoc. Nor can they be designed and run only by outsiders. Tribal people need to lead suicide prevention within their communities, says Robyn Atencio, Behavioral Health Director at the Five Sandovals Indian Pueblos, a nonprofit that administers grants and provides services for the pueblos of Cochiti, Jemez, Sandia, Santa Ana, and Zia in central New Mexico. A new prevention initiative at Five Sandovals screens schoolchildren as young as those in Head Start for risk factors. As part of its Methamphetamine and Suicide Prevention Initiative (MSPI), a national pilot project, the federal Indian Health Service (IHS) is funding 125 federal, tribal and urban programs to reduce meth use and the suicide crisis in Indian Country. With that IHS funding, Five Sandovals is collecting data related to family history, suicide attempts and suicide ideation. The survey results will be shared with IHS and tribal governments so they can “apply for grants and plan programming,” according to Atencio. While she isn’t sharing data with the public, Atencio says the numbers look better than they did a few years ago: Those pueblos have had no successful suicide attempts in the last five years, she says. Following the cluster of suicide deaths in Mescalero in 2009 and Thoreau in 2010, community leaders, educators and health workers gathered to discuss suicide prevention among Native American youth in New Mexico. Eventually, the New Mexico Legislature created a clearinghouse overseen by the University of New Mexico. Its mission: connect the state’s Native American communities with culturally appropriate prevention initiatives. The legislature has yet to fully fund the clearinghouse, however. Atencio is cautious about the clearinghouse. In the past, she said, well-intentioned people at the state level had come up with good strategies, then reached out only to find that the tribes had already created prevention initiatives. “We’re like, ‘Hey, wait a minute. What you’re doing is great, and we love the outreach, but you really need to be talking to us because we’re doing great work here,’” she says. Tribal people are also wary about outsiders asking questions and studying their communities. Historically, university researchers have often visited tribal communities to collect information and stories, Atencio says. Then they leave, taking with them the information necessary to publish studies or complete dissertations, leaving community people to rarely glean benefits, or even information, from the completed studies. With some of those issues in mind, in 2012, the New Mexico Legislature approved a tribal board to advise UNM on the clearinghouse. When she first started working on suicide prevention, Atencio asked herself why she was doing such heartbreaking work. But she just couldn’t get over the disparities. Her disappointment — and sometimes, anger — keeps her working on the issue. She appreciates the work non-Native people do, Atencio says. She knows their intentions are to try and make things better. “But it’s never going to even touch the surface unless we don’t — as a people — start looking at all these truths and talking about it and healing,” she says. There need to be better screenings, better interventions, and better services, she says. And tribes need to start generating money so they’re able to have those same protective factors as other populations whose suicide numbers aren’t so high. A prior version of this article incorrectly stated that San Juan County, not McKinley County, cut funding to a community center.